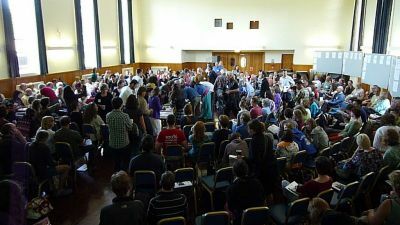 Three hundred people came to South Devon in England for the fourth gathering of the Transition Network. They were a modest cross section of the many thousands of people now involved in 330 official Transition initiatives (up from 170 this time last year) and many more less formal groups around the world that are ‘mulling over’ their participation. Rob Hopkins’ reflection on the event is here. There are numerous blogs about the event here and short videos here and here and an especially moving one, I find, here. Although the Transition movement prefers practical steps over abstract analysis, an apocalyptic tone was set on the first day by Stoneleigh’s presentation on the financial crisis. In a clinical, even brutal, ninety minute presentation, the co-author of the Automatic Earth blog described the convergence of Peak Oil, and the ‘collapse of global Ponzi finance’, as ‘a perfect storm of converging phenomena that threaten to sink our age of prosperity through wealth destruction, social discontent, and global conflict’. Stoneleigh told us that the energy crisis and the financial crisis are feeding off each other, and that ‘many pension fund assets will be worth pennies on the dollar as soon as extend and pretend can no longer be maintained and there is a serious price discovery event’. Describing the hydrocarbon epoch (the one we’re in now) as a ‘fleeting interlude in history’, she went on to anticipate a ‘net energy cliff’ and an accompanying deflation – with house prices liable to to fall by 90 per cent. Now I’ve followed Automatic Earth (among several other financial blogs) avidly for three years – and I well recall the visceral fear that this story provoked in me when I first read it. Although the financial crisis is abstract, being told one may soon lose all financial security is more viscerally shocking than the also abstract but longer-term menace posed by peak oil and climate change. Until now the Transition movement has been motivated by, and has focussed on, peak oil and climate change. For many people hearing Stoneleigh last weekend, her story was unexpected and shocking. A distressed woman in her fifties told me she was was distraught less about her own prospects, than by the fact that both her children had recently taken out large mortgages. At the Transition gathering, the shock-and-awe of Stoneleigh’s talk was followed by three days of supportive and nurturing encounters. A unique feature of Transition’s culture is the careful attention it pays to the danger of burnout. A variety of emotional, psychological and spiritual support is available informally and formally – from co-counselling, to wild swimming. But elsewhere on Stoneleigh’s speaking tour many people leaving her talk will do so on their own. One has to question whether a couple of bullet points telling people to ‘get out of debt’ or ‘connnect with your community’ is an adequate way to help people deal with this kind of information. Luckily I was able next to join the Woodland Walk. Robin Walter, a Chartered Forester, took us up a hill to the top of a burial mound. There followed a discussion as we looked across the countryside for miles in every direction. We learned that that the UK’s Forestry Commission has examined the potential of the UK’s trees and woodlands to help the country mitigate and adapt to a changing climate. It transpired, in our mound-top seminar, that forests could meet 10 percent of UK energy needs according to some scenarios. The problem is that this would be accompanied by a return to monocultural industrialised forestry and the widespread of GM-enhanced and no doubt copyrighted trees. And how long would it be, someone asked, before we once again ran up against peak wood? It is essential to focus on diversity, and use permaculture principles, our group’s experts in holistic agro-forestry explained. The trend is away from nature ‘reserves’ to managing the ‘holistic agro-ecological environment’. Hedges can be used as rotational crops. Buildings can be made with logs rather than with sawn planks, as in Ladakh. Native trees can be used as herbal remedies and foods. Healthy communities and healthy ecosystems can follow our use and knowledge of woodland. We moved from the burial mound to a 20 year old coppice. A hectare or two of trees can in principle yield enough energy for a household heating needs – but harvesting the wood can be hard work. Tree-hugging, we learned, on-site, is not an effort-free option. But supposing one is ready to do the work, how does gain access to a forest? In Transitionland, an answer is never far away: Various groups are setting up Collective Land Action Networks, or CLANs. Citizens buy shares in the CLAN which buys plots from a few acres, to large farms with woodland. One CLAN, called Lands Roots, plans to open up its plots to Community Supported Agriculture, community gatherings, seasonal celebrations, workshops and courses, including eco-building, green crafts, permaculture. Each share is £250 [euros 300]. I got back from the coppice in time to hear Peter North introduce his brand new book Local Money. Open Money is one of those subjects I’ve enthused about enthused about in print. But North has spent 14 years traveling the world – from Curitiba to Russia to Venezuela – to learn first-hand how different approaches actually work (or not). North’s book describes in practical ways how people have coped with financial armegeddon in the past. Following economic collapse across the world, communities have often created their own forms of money. Local Money shows how people manage to make it through even when official money disappears. There’s a database of local, open or complementary currencies here. I pondered whether local money is necessarily hand-made and ultra-local? This being a Transition Towns gathering, I soon met a software designer, Matthew Slater, who is building customisable digital barter money platforms in Drupal. SELs (a European version of Local Economy Trading Scheme) are already being trialled in Belgium (5) France (2) Switzerland (2) and India. Community Forge as the platform is called, is community currency trading software build on a social networking platform. This means thousands of software developers can set up similar sites, and many of them could easily modify the software. As a popular open source project, the code is very high quality and continually improving. I then joined a group that had ninety minutes to discuss housing: How to organize and use the space we’ve already got – and how, using what materials, to build new homes and refurbish 30 million (in the UK) existing ones. (By now I had realised that the function of Trasition Town encounters is to alert people to the existence of different kinds of knowledge – not to ‘solve’ complex – and often unsolvable – challenges). In this spirit, we discussed the need to distinguish between different kinds of co-housing, co-operative housing, and intentional communities. What’s needed, we agreed, is an easy-to-understand ‘palette’ of shared housing models. In our group, a consensus emerged that small private spaces, with one’s own front door, around a larger collective space containing shared facilities, seemed right – as is the case in many African villages and Chinese ‘Hula” buildings. Why do planners go on about the ‘need’ for more and more one person dwellings, someone asked? Why don’t planners and policymakers make it easier to share resources, including space? Why indeed. Oil depletion means that these ‘needs’ are not a long-term option. But questions of ‘ownership’ are powerful in the culture – not least because people value tradable assets. Besides, many local councils oppose ‘studentification’. On the plus side, we already have a lot of housing – but it needs to be insulated. Natural materials are not necessarily the greenest insulation choice, we are told. Modern forms of insulation are more efficient that hair from goats, sheep – or humans. Artifical high-tech foams might be energy intensive to make – but would they not be the best thing to spend our remaining energy on? A cultural battle looms. The best solution is to cover the outside of every home in Britain with ten inches of foam. A man from England’s oldest intentional community told us about his hut made of straw bales, timber offcuts and second hand windows. Others praised the resource efficiency of favelas and shanty towns, where not even a nail is wasted. ‘Hopelessly avant garde’, said an expert in Saxon building techniques; he wanted Devon County Council’s Mineral Planning Committee to reverse policies that undervalue rubblestone. I was keen to discover if the Transition model was being, or could be, developed in France, where I live. Twenty people came to a Transiton-France discussion. Exporting the Transition model in a box to France, or any other country, is not an option, we agreed. For one thing, the array of exiting sustainability and permaculture projects in France is extraordinarily rich. There are possibly more more websites, magazines and events about all things ‘developpement durable’ in France than in the UK. On the ground, degrees of resilience already exist in parts of France without the existence of Transition initiatives. France has hundreds of thousands of active local associations; these are a form of social glue that Britain lacks. The persistence of local food webs is another example. AMAPs (a French version of Community Supported Agriculture) are spreading fast. ‘Monnaie locale’ is being trialled in several places (see above). There is also a fast-growing debate about economic fundamentals in France in the ‘Decroisasance’ (De-Growth) movement. So what are the gaps, that Transition-ness might fill? What’s missing, we concluded, are three things:First, a perceptual framework, a story, that links together peak oil and energy, climate change, and the prospect of a massive financial discontinuity. Second, France would benefit from a more explicit means to connect together and leverage the multitude of stand-alone projects that are already there. And third, the Transition model brings with it a degree of incusivity – of cultures, ages and backgrounds – that is uncommon in socially fragmented France. A meeting of Transition France takes place in Trieves on 27 June. The France session prompted me to join a discussion, convened by Gerd Wessling on the last morning, about ‘national hubs’. What forms of governance and organization are needed to help Transition initiatives do well in different countries? (Although the Transition movement is only four years old, some kind of national office has already been established in Scotland, Ireland, Sweden, Italy, Netherlands , the USA, Canada, and Japan). Ben Brangwyn, one of Transition’s co-founders, explained that the purpose of Transition Network, its office in Devon, is to ‘Inspire, Encourage, Connect, Support, and Train’. It is conceived as a support entity rather than a centre of power and control – still less as a centre that will ‘deliver services’ to local groups around the world. The model assumes that support services will be co-created and draw on resources of the parts. The words ‘re-weaving’ and ‘connecting’ cropped up thoughout our session. But if the philosophy is one of decentralization and autonomy of local groups, Transition Network has remained responsible until now for determining which aspiring groups become official Transition initiatives. As with Wikipedia, and Open Source software, decentralisation and bottom-upness does not mean no rules at all. ‘Translating’ the Transition model for adjacent countries and cultures is in any case fraught with difficulty. In Spain, the very word ‘Transition’ is negatively associated with Franco – and local food, a central focus of the UK movement, denotes poverty and backwardness. In France and The Netherlands, the word ‘collaboration’ triggers negative memories of the war. In Scotland, we learn, more people speak Hindi than speak Gaelic. I was much impressed by the way Transition Scotland has addressed these dilemmas. Transition Support Scotland was set up (with modest Scottish Exzecutive funding) to assist the thirteen Transition initiatives, and many smaller projects; but the words ‘national’ and ‘hub’ do not appear in its communications. What already works well as a scalable model is Transition Training. There are already 60-70 trainers in Germany, for example. We discussed whether the ‘worker correspondent’ model developed by the Bolsheviks, or the agricultural extension services deployed during the Depression years in the USA, could be a source of further refinement for Transition Training.